This beautifully designed bed frame is the latest in modern designer bed frames. Offering a stunning patterned design on both the foot and head end the bed can add style and sophistication to any bedroom. 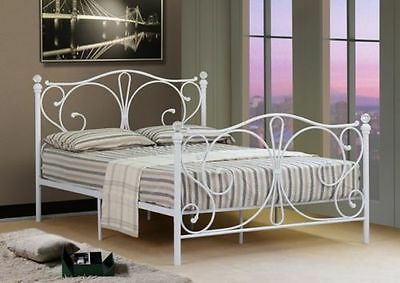 Available in white finish the bed also has a scroll feature to the head and foot ends giving an extra sculpted look to an already striking looking bed frame. If you reside in an area that is not on the UK Mainland yet isn’t mentioned above, please contact us for a delivery quote. Deliveries:We take great care in ensuring our products are packed to the best standards possible, however in very rare instances these items can get damaged by the courier companies.When you receive your item look around the box for obvious damage to the item and sign for it as damaged even if the damage is the tiniest scratch.If the courier is not prepared to wait whilst you look over your new items then please sign for it as damaged as this will ensure that if the courier did actually damage the item claims can still be made against the courier and therefore protect you should we need to replace any items.If you do not sign for it as damaged or unchecked you will not be covered should the item turn out to be damaged, so please sign for the item as damaged or unchecked even if you see a slight scratch on the box to ensure you are fully covered.